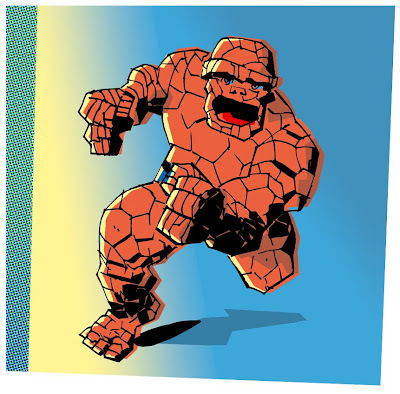 Posted June 15, 2009 in Fantastic Four, Pepo Perez, The Thing. Spanish Artist/Writer/Graphic Designer Pepo Perez provides this graphic depiction of the ever-lovin‘ blue eyed Thing. Pepo’s comics work includes ‘Orígenes Jaque Mate: Sangre‘ and ‘El Vecino‘ and he has also contributed illustrations and articles for the magazines ‘Volumen‘ and ‘Rock de Lux‘. Pepo has written several articles about Jack Kirby at his blog, ‘Es Muy de Cómic‘ (English translation required) and more of his art can be found at his website.